I will be talking on the Factor Investing panel at the upcoming Evidence-Based Investing Conference in Dana Point, CA next Sunday –Tuesday. I am excited for the opportunity to chat, and figured I would highlight a few thoughts we have on the topic going into the event. First, what is “evidence based investing?” What does that even mean? If we read a index factsheet, review a long-term live track record, or read an academic finance paper, are we now an evidence-based investor? No. To me, evidence based investing means reviewing all the relevant research on a topic, viewing this body of research as a whole, understanding the economic/human underpinnings of the finding, and then making an informed decision that is as objective as possible. Achieving the title of being an “evidence based investor” sounds easy, but the reality is that this is incredibly difficult. This difficulty is only magnified by the sheer amount of information and (so-called) research being distributed into the marketplace. To solve this information overload problem investors often get complacent and rely on a single firm’s research (or research group) to inform their opinion on all matters. This approach will likely turn you into a faith based investor, not an evidence based investor (see here for a piece on the subject). And when it comes to factor investing, we often see well-meaning investors, who want to be evidence-based investors, quickly devolving into faith based investors who are no longer critically reviewing and assessing the available research. Factor Premiums — Are they here to stay? Factor Portfolio Construction – Does it matter? Factor Investing Funds – What are you actually buying? Factor Investing Premiums – Are they here to stay? Are factor premiums here to stay or have they been arbitraged away? This is a common question we are asked. As advocates of factor-investing(1), how does one respond to the countless articles citing the evidence that factor/active funds are losing to the passive index? Our response is not satisfying: active (factor) investing is simple, but not easy. As we have highlighted in the past (I recommend you read the entire article), active factor portfolios are notoriously challenging for investors. Consider value investing, the most well-known factor approach. Value investing has had numerous periods of underperformance, especially during the Internet Bubble. Using Ken French’s data, we examined just how painful it was to be a value investor in the late ’90s. Talk about a bad stretch! Looking at the annual returns (shown in Figure 2), value investing lost almost every year to the market! Sticking with the value strategy, although painful, was richly rewarded with a 4.67%+ edge–per year–over the market benchmark from 2000-2014. Is momentum dead? Blue line is a portfolio long winners, the dotted line is a portfolio that is long losers. They are converging, rapidly. The results are hypothetical results and are NOT an indicator of future results and do NOT represent returns that any investor actually attained. Indexes are unmanaged, do not reflect management or trading fees, and one cannot invest directly in an index. Additional information regarding the construction of these results is available upon request. The chart certainly follows along with the story — but correlation is not causation. Here is a chart extended back to 1801, which shows that decade-long periods of poor relative performance are not uncommon. If we subscribe to the theory that better technology, smarter people, and more competition are associated with arbitraging away the momentum factor premium, we also need to then potentially explain why momentum went on a 10-year drought following the Civil War. Were the momentum premiums arbitraged away? Perhaps these premiums are simply riskier. So witnessing long absolute (and relative) performance droughts, is a feature — not a bug — of momentum investing. If higher risk is a feature of factor strategies they should command long-term expected return premiums — otherwise, why would anyone take the other side of the trade! In short, factor investing strategies need to be painful in order to be sustainable. If factor strategies represent $20 dollar bills lying on the street, one can be sure they will vanish almost immediately and never be seen again. They will lose to the market with a 100% probability over some time period. They will experience a multi-year relative performance drought. Again, if factor investing were easy, and allowed everyone to beat the market every year, the premiums would certainly disappear — no pain to invest in factors, but all gain…why not! Market experience suggests that markets are very competitive so situations of no pain, but all gain are transitory. To the extent that one believes a factor has a premium above and beyond the market return, one needs to identify the pain associated with investing in a factor — and be ready to embrace it. This pain could be higher fundamental risk and/or some relative performance pain, but there has to be a catch for it to be sustainable. Once one understands the potential pain of their factor investments, they can identify if they are well suited to take on this pain to reap the potential gains. Some people are, but most are not. For example, if an investor is going to examine their Value portfolio in 2 years and compare it to the market, we would highly recommend they switch to passive Vanguard funds. (4) Otherwise, the risk of this investor selling a factor at the wrong time is too high. These investors will end up contributing to factor premiums, not exploiting them. Now here is another practical application. 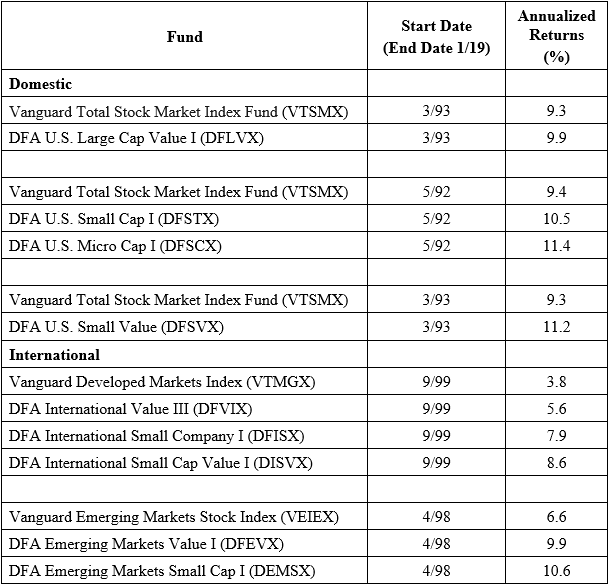 Consider an investment in a Vanguard US Index fund. Few would question this purchase. However, this investment is implicitly betting on the US equity risk premium, or the spread in returns between equities and bond/cash investments. The US equity risk premium is often considered an “anomaly,” just like value or momentum investing. The equity risk premium is obviously volatile, but perhaps there is a reason to believe it will decrease because everyone already knows that stocks beat bonds over the long-term. Common reasons for the equity risk premium center around the same arguments – investor behavior and investor risk preferences. Luckily, there are many pundits that can predict future factor premiums based on (inherent) assumptions on (1) investor behavior and (2) investor risk preferences. So what if we allow machine learning algorithms determine that we should have 100% of our capital in the US equity premium — this will decrease the premium because everyone (using their machine learning algorithms) will do the same and follow this “rational” advice. So I will leave you with this question, which I do not know the answer to. For anyone who wants to argue that factor premiums, such as Value and Momentum, will go to zero, I ask you the following – will the equity risk premium exist in the future? Factor Investing – Does portfolio construction matter? We can argue about factor investing in the future, and what the premiums might look like over the long haul. These are important discussions. To inform our opinion on these debates we can infuse it with some data from the past. Investors are lucky nowadays because they can lean on the backs of thousands of Ph.D. students grinding on the stock databases. Here is a link to one (of many) papers highlighting all the anomalies in the literature (here is a replication paper). A few factors tend to pop out from the literature and from our own research – Value, Momentum, Low Volatility, Quality, and Size. These factors all exhibited a “premium” over the value-weight market portfolio in the past. In general, these factors appear to be the most robust, but none of them are perfect (arguably why they exist). Momentum portfolios (1970 – 2016). Now to be clear, the results shown above are before any management fees or transaction costs. (14) We allow the reader to judge an appropriate transaction cost to apply, as many argue over this number (see here and here). However, if one assumes 0.25% per rebalance, the results are pretty clear for Value and Momentum – in the past, portfolios with more concentration (less stocks) and more frequent rebalancing (such as quarterly), outperformed a larger-stock portfolio that is only rebalanced once a year. As long-term investors looking to capture the largest equity risk premiums should we all switch to concentrated Value and Momentum portfolios that are rebalanced more than one a year? Most investors like to track the broad market indices. However, one thing is clear from the charts above — a strong positive relationship between factor returns and tracking error. In short, if you want more expected returns, you need to embrace the risks associated with tracking error. This finding has implications for a variety of investors. Consider an independent financial advisor building a portfolio on behalf of a client. Part of the advisor’s job is to understand the client’s goals as well as the client’s mindset when it comes to investing. If the advisor believes the client is going to ask every quarter (or ever year) how they did relative to the index, and if they underperformed they will quit the strategy. In this case, it is probably not a great idea to invest in concentrated factor portfolios. Perhaps the advisor sprinkles in a small dosage of concentrated Value or Momentum (5% or less) alongside a bunch of cheap beta? Maybe they go for a more diluted version of Value and Momentum with less tracking error and put 50% in the “smart beta” form of the factor and 50% in cheap beta? An evidence based investor should make portfolio decisions based both on the knowledge of the (1) portfolio construction and (2) the mindset of the investor. Factor Investing – What am I buying? Now let’s assume we’ve read all the academic research on factor portfolios and factor premiums. 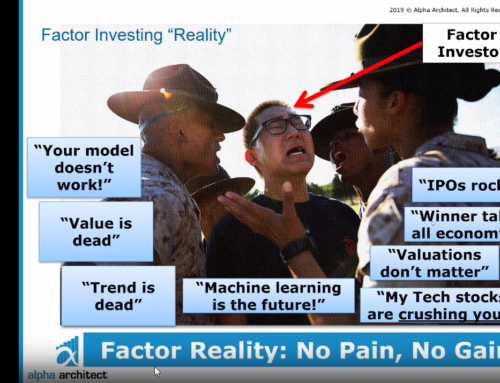 We know factor investing is –and has to be — painful at times. We know factor investing portfolio construction has effects on determining the expected excess returns. Now let’s turn to the market to purchase a smart-beta factor portfolio that incorporates all the knowledge we have on our plate. Unfortunately, this can be harder than anticipated. Investors are faced with a serious challenge these days. Even if you have a PhD in finance, it can be hard to identify what you are buying based on the marketing materials and analytical tools available in the market. That said, one way an investor can identify what a portfolio delivers to an investor is to examine the portfolio factor loadings over time (a DFA favorite). However, factor models can be finicky, and changing how one defines the factors (e.g., the definition of the “Value,” or HML factor) can have massive impacts on the conclusions one makes. Another approach is to understand how a portfolio is formed (e.g., construction analysis above), and how this will drive portfolio characteristics (e.g., B/M of .5 versus 2), which will arguably be more predictive of expected excess returns than the factor loading. (see here for some research on the topic). This approach is useful, and we highlight the results above, but this approach is also unrealistic for the typical investor unless they are extremely sophisticated and can program. Another tool (aside from tracking error) is to examine the “active share” of the portfolio to determine how different the factor-investing fund is from the market-cap weighted index. (16) Active share calculations are hard to come by and this measure is not perfect, as being highly active does not necessarily imply outperformance. One still needs to understand the characteristics of the portfolio. For example, one can purchase a high active share overpriced growth stock portfolio, but it is unclear whether or not a long-term factor investor wants a high active share bet on what has historically been a long-term loser factor. We’ve even attempted to create our own tools to help investors make better decisions. We call it visual active share (were developing this further over the summer). The mission of visual active share is to create a 1) simple, 2) intuitive, and 3) powerful way for investors to understand what they are buying. Currently, the tool allows investors to select (U.S. based equity) ETFs and view the underlying holdings, where the holdings are ranked on a laundry list of common factor characteristics, such as market-cap, Book-to-Market, Momentum, etc. To see how the academic portfolios work, start typing “academic” in the “add ETFs” box of our tool. Let’s stick with the classic value measure in academic literature — price-to-book. We type in “PB_BTM” or “academic bottom decile P/B.” Out pops a portfolio. We percentile rank the underlying firms along the x-axis on the Price-to-Book measure (inverse of book-to-market) and along the y-axis on market capitalization. As one can see, the academic portfolio (not an actual ETF) buys the cheapest 20% of stocks based on price to book (we eliminate micro-caps). Now let’s select the SPY ETF, which invests in the SP500 stocks. As one can see, SPY is a large-cap fund with little deference to value or growth characteristics (as defined by P/B). Let’s say we want a little value exposure. We pick a Value ETF, the Vanguard S&P 500 Value ETF (VOOV). Now to be clear, I am not picking on Vanguard here – I believe they are a great institution that has done more for investors than any other financial institution in the last 40 years. And to be fair, their Value portfolio uses numerous value measures, so they shouldn’t exactly line up with the academic portfolio. Second, they are Vanguard – they are taking in billions of dollars a day, so they need to invest in larger stocks that have enough liquidity. By construction, they almost have to be close to the S&P 500. However, I think most would agree that their portfolio is not capturing the risk/rewards of the academic value portfolio. So to the extent that an investor wants to capture the academically documented factors (such as Value and Momentum) in unique and differentiated ways, our tool will help to assess ETFs currently available in the marketplace. I covered a few topics pertinent to factor investing. First, will factor investing premiums be here in the future? I believe they will exist due to investor behavior, but I could be wrong. In the future if the headlines state that “investors plow record amounts into vastly under-performing Value funds” – I may be worried. However, people generally chase performance, and the same goes for factors. Second, portfolio construction mattered in the past – it is something an evidence-based investor should understand. Third, assessing real-world portfolios can be difficult, so we are trying to help build tools to help the investing public. I look forward to the factor investing panel at the evidence based investing conference next week. If you are going to be there and want to meet up, please let me know! 3. ↑ Two Centuries of Price Return Momentum by Chris Geczy and Mikhail Samonov. 7. ↑ I wish I had this knowledge! 9. ↑ See our paper examining all the Value factors here, and the updated data here. 11. ↑ Note for any holding period over one month, overlapping portfolios are used. 13. ↑ Note the Universe returns are slightly different due to the Value portfolios requiring fundamental information that Momentum portfolios don’t require. 14. ↑ Transaction costs were much larger in the past then they were today. We discuss competing research on momentum transaction costs here, here, and here. 15. ↑ Here and here are some primers on the concept. 16. ↑ Here is a tool by Professor Marijn Cremers. We also have a tool on our website. 17. ↑ You can read more about this here.